Experience The Wonder Of Robins and Doves As They Raise Their Young. What could be more enjoyable then watching your favorite birds gather nesting material, incubating eggs, and raising their young while you watch from the comfort of your deck or patio chair? Imagine the sound of Robins in the morning just outside your door. Or listen to the soft coo of the mourning dove as she broods her young. 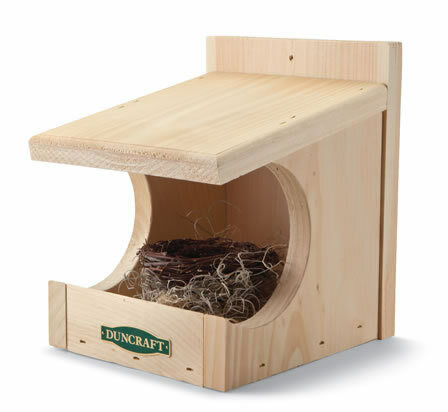 Wild Bird Watching.com is proud to offer the Duncraft Nesting Shelf. Ideal for attracting platform nesters such as Robins and Mourning Doves. These birds don't use traditional birdhouses for nesting. They prefer a platform to nest on. These nesting shelves or nesting shelters are plenty large enough for any of these birds. Each Nesting Shelter measures 8 x 7 x 9 inches. And remember, Doves and Robins will return to the same nesting site year after successful year. Place these nesting ledges under the eaves of your house, garage, or outbuildings. Secure it to a tree for easy viewing. The perfect way to attract those birds that don't use bird houses. Don't miss out on attracting more birds to your backyard.